On Thursday 8th October, residents of Balsall Heath will have the opportunity to vote on whether the City should use the Neighbourhood Development Plan to help decide planning applications. Many local people will know that the area has not been best served by planners in the past, so this is an opportunity to vote on plans which have been developed by local residents. Local Film Maker Haqi Ali has made a short film about Thursday 8th October’s Referendum based on interviews with local residents. You can hear why they think that voting yes is a good idea. The Neighbourhood plan is available to read online at www.balsallheathforum.info. It includes the following policy regarding Historical buildings (apologies for the small text, we recommend using a large screen to view). Balsall Heath residents are eligible to vote at the the same polling stations used for local and national elections. Whilst the plan does not specify usage for the building, it does put emphasis on the building being protected and maintained by its owner. 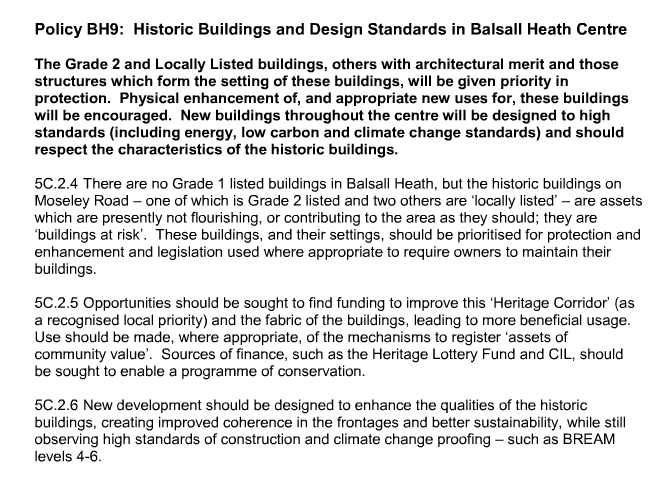 The Baths is already registered as an ‘Asset of Community Value’, so the hope is that the plan, if passed, will secure the building (in planning terms at least) for the use of the community, and hold the Council to looking strategically at the historic buildings along that section of the Moseley Road. I went to Clifton Rd school and learned to swim at Moseley Rd baths – it was my ‘first freedom’, the second was the library next door. Last year, on a first trip back to brum for 55 years, it was pleasing to see how the latter is being developed – albeit slowly. It was not possible to access the Bath building, but perhaps no great visual loss as have seen web images taken over recent years. As far as possible, I don’t live in Europe or ex colonies, have tried to follow the issue of renovation. To me, it seems that LA is intent on ultimate demolition through simply yet very deliberately failing to maintain facilities and ultimately the structure. What rancid rapacious wretches inhabit the council – others pose as MPs – Percy Shurmer would have given them short shrift (and scored their wallets) I was one of his Sparrows and lived in his ‘Sparkbrook’ constituency – always seemed more BH to me as a lad.